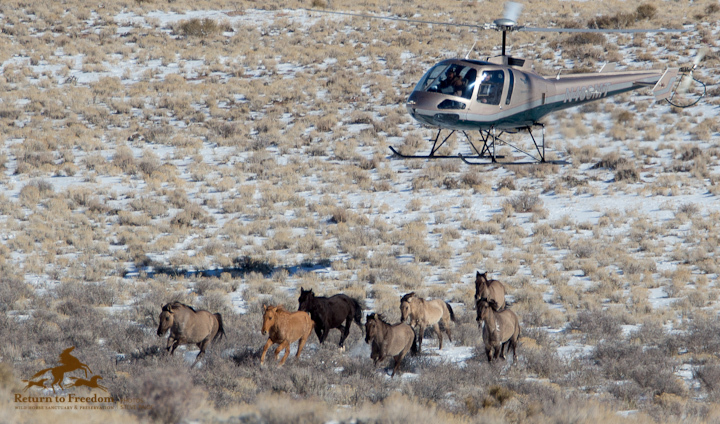 A contractor’s helicopter pursues wild horses during January’s Sulphur Herd Management Area roundup in Utah. File photo by Steve Paige for RTF. Update: Statement from Return to Freedom. A senior Interior Department official called Wednesday for lifting restrictions on sales and euthanasia for wild horses and burros to rein in run-away costs associated with managing growing herds roaming the West’s public rangelands. “With no predators and lack of management abilities, herds will grow 15 to 20 percent a year. It is decimating the rangelands,” Skipwith said Wednesday told a national conference held in Salt Lake City. She issued a plea to allow science, rule of law and “common sense” to help solve the vexing wild horse question saddling the Bureau of Land Management. The federal agency is responsible for overseeing horses and burros, non-native descendants of domesticated animals released by European explorers and pioneers. Her organization planned to join the American Wild Horse Campaign and other advocacy groups Wednesday at noon to protest the summit in front of the Marriott City Creek, where the meeting convened with presentations from Utah Gov. Gary Herbert, Reps. Chris Stewart and Rob Bishop and scientific panels organized by Utah State University. Skipwith and other speakers accused these groups of caring more about fundraising than the horses themselves. Horse advocates insist BLM must fully embrace fertility-control measures as an alternative to costly roundups, yet contraception was barely mentioned by Wednesday’s summit speakers. Immunizing horses against pregnancy seems to work in some areas depending on topography and other factors, according to wildlife biologist Rick Danvir of the Western Landowners Alliance. “We need to look at permanent sterilization more seriously along with unrestricted sales,” Danvir said at the summit. Advocates, though, fear such sales would result in “excess” horses being exported to Mexico and other countries that allow slaughter of horses for food.